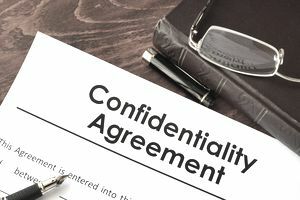 In the course of setting up a client or project, freelancers may come upon a "nondisclosure agreement." This generally asks that the writer not divulge certain information to the public. For example, websites may ask that you not publicly talk about their pay structure, or authors may ask that you not talk about their book or plot. This request is designed to protect the interests of your client; they want to make sure their ideas and trade secrets aren't used by competitors. Some specific points to look for in nondisclosure agreements include what kind of information, exactly, you're not to disclose. For example, many clients ask that rates not be shared. Also, check for time limits. Is it forever, or could you discuss the work or project after it comes to fruition? For example, you'd probably like to talk about the plot of a book you've edited after it's already been published, right? This nondisclosure agreement template and other contract templates in this series are solely for your personal use and perusal as learning tools. These samples were garnered from experience, research, and the aid of a professional organization representative. You should consider retaining a lawyer for the most important documents related to your freelance writing career. In addition, your professional union (such as the National Writers Union) may be able to get a contract or may offer a template. This is especially important in this case as nondisclosure agreements sometimes have heavy monetary penalties if breached. This Agreement is hereby entered into between Company and Freelancer specifically to avoid the unauthorized disclosure of trade secrets, confidential information, and company intellectual property as defined below. Both Company and Freelancer freely enter this confidential relationship as evidenced by signature below. I. Definition of Protected Information: Parties agree that confidential information furnished by Company may include information prepared by the Company, its employees, contractors, or other roles. Further, said information may be presented in any medium, whether in writing, via spoken communication, or through electronic delivery. The material includes all confidential, proprietary, or trade secret information relating to the Project, including Details of Project To Be Disclosed (i.e. the novel's plot, pay structure, publications, etc.). Company will make every effort to identify plainly such information to Freelancer. The material does not include any information which is generally known or public knowledge which is readily available. II. Definition of Parties: Other roles covered under this agreement, in addition to Freelancer signatory, may include associated contractors, subcontractors, mentors, employees, or advisors such as consultants, tax preparers, and attorneys. III. Material Limitations: This agreement stipulates that information and material disclosed will be used solely for the purpose of completing Project Title. All material disclosed will be kept confidential and will not be shared or otherwise used by interests outside of those contracted except that material and information which is needed in the due course of completing Project Name. All parties will agree to keep such information out of the public eye and shall agree to the terms of this NDA. IV. Breach: Unauthorized disclosure will be considered a breach of this agreement. Freelancer agrees to be responsible for breach and agrees to take all reasonable measures to avoid breach. This includes return of material, destruction of material, or other fair treatment at Freelancer's expense. V. Court Requirements: In the event that disclosure is requested as part of a valid subpoena or any order issued by a court of law, Freelancer agrees to immediately notify Company of the request, contact Company for pertinent advice and action, and make best efforts to continue to protect Company's interest, in accordance with law. In addition, the Freelancer will not hold any liability on the part of the Company in such a case. VI. Freelancer acknowledges that this agreement is for the benefit of the company and therefore agrees that it will be governed in accordance with the laws of Company's state. VII. Parties agree that the term of this agreement shall be Date to Date, or until such a time that mutual agreement and dissolution is reached. The nondisclosure may be part of an overall contract or it may come before the freelancer is even offered a contract. Often, the client wants to speak freely about the potential project and therefore will ask the freelancer to sign before the project is even off the ground. Remember, most aspects of contracts are negotiable. If you're not comfortable with what your client wants you to sign, make sure you check in with them. This specific contract is generally one with the most repercussions to the freelancer. Therefore, carefully read it and follow it to the letter. Check in with an attorney or union rep/professional organization if you are at all uncomfortable with what your client is asking you. Contract management software should be a geniune consideration.